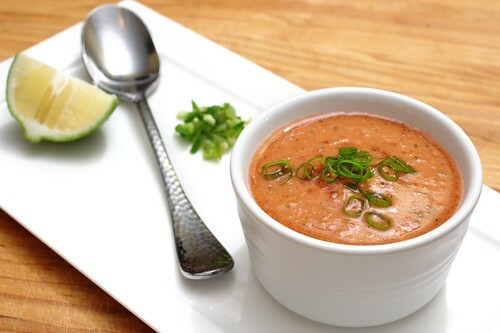 spicy summertime gazpacho with fresh cherries, originally uploaded by aarn! +13th July, 2010+. quartered eight medium sized tomatoes and placed them in a plastic prep tub. sprinkled 3T. of salt over the tomatoes, and mixed them around to get an even coating. roughly chopped two stalks of celery, with the greens, and threw them into the tub with fifteen or so pitted and stemmed fresh cherries, a quarter of a sweet vidalia onion, 1 clove of garlic, the nose half of a jalapeño pepper (without seeds), 1t. of crushed caraway seed, a pinch of celery seed, a large handful of fresh cilantro with the stems, fresh cracked pepper, a pinch of cayenne, and 1/2c. of extra virgin olive oil. allowed the tomatoes, vegetables, and seasoning to sit on the salt for an hour or so at room temperature, until a fair amount of liquid had leeched out of the tomatoes. blended everything in the bin together with another 1/2c. of extra virgin olive oil, the juice from one lemon and one lime, and salt, pepper, and additional jalapeño pepper (or just hot sauce) to the taste. stuck the mixture in the refrigerator for a few minutes and then served in a chilled bowl, garnished with sea salt and thin sliced green onions. Oooooohhh yum. That is making my stomach hurt with desire. Wow. I had some really good gazpacho while in NY for the 4th. I suspect yours is better. wow.. that sounds amazing.. guess i know what to do with some of those cherries in the fridge!